The OR table on which the patient rests should be mobile, to allow the table to be repositioned during the retrieval process whenever helpful. This table (photo) has hydraulic mechanisms to facilitate repositioning (up, down, Trendelenburg, reverse Trendelenburg, right or left lateral tilt). Trendelenburg position is a position in which the head is low and the legs are on an inclined plane upwards (sometimes used during pelvic procedures to displace the abdominal organs upward out of the pelvis). This table is also equipped with Allen’s stirrups that are padded and can to be repositioned. 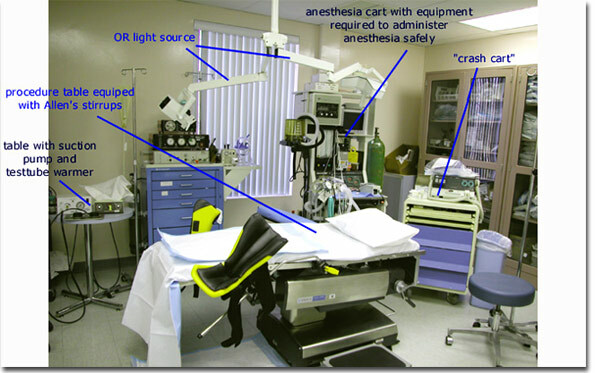 The Anesthesiologist often stands or sits at the head of the procedure table. Anesthesiologists often use complex monitoring systems to identify patient well being during the procedure. Operating room lights may hang from the ceiling and can provide a tremendous amount of light when needed during the procedure.